The tech-savvy president of a company recently told me he’s confused because he heard keywords don’t matter anymore with SEO. It’s not the first time I’ve come across that view about keyword phrases. Three major changes in recent years may be feeding the misguided notion that it’s foolish to focus on keywords. In a sense, Google is the culprit. Google’s Panda algorithm update in 2011 placed a stronger emphasis on high-quality content. Google also introduced “Not Provided,” its pathetic move to conceal organic keywords to protect searchers’ “privacy” interests in 2011. In 2013, Google released Hummingbird, its new search algorithm that stressed the importance and meaning of search strings over individual keywords. Other trends likely have shaped the “keywords-are-dead” attitude, including the significance of evolving search-engine-ranking factors like searcher intent and inbound links. Marketers also shape authoritative content around ideas and not specific keyword phrases. I’m all for identifying topics for content. At the end of the day, however, you can easily fall short if your strategic set of “ideas” and “topics” excludes any serious keyword analysis. Content teams always want to know what keywords they need to target. I just try to temper their enthusiasm by moving toward a reasonable list of strategic keywords (the number varies by company size, product categories, and budget). It’s good to know whether you’re shooting too high or too low with keywords. Many companies dream big. In other words, they target pie-in-the-sky keywords that have no chance of ranking given the competition. Or, they produce content with keywords that are rarely searched. It’s super easy for any given website page to be overwhelmed with keyword phrases. How so? If you have a page about product XYZ and it supports 42 keyword phrases, you might want to know that. Well, that may sound terrific. Who wouldn’t want to have a page that ranks for 42, 60, or 100 keyword phrases? Not me. First of all, the page’s rank is not all likely to be No. 1, let alone No. 1 through 10 on any search engine. Chances are, a few results could be on the first page and some might be No. 12 or No. 56. I’d rather find more relevant pages (existing or new) for some of the keyword phrases so they have a better shot at ranking well. Marriott has a problem that’s not uncommon. In the following example, you see ranking data for some Las Vegas keyword phrases. To be fair, the same Marriott page ranks better for other branded and non-branded keywords. But this example illustrates the issue. Maybe Marriott should try to rank for these keywords on other pages. After all, this small set alone represents more than 4.4 million annual searches on Google. Yes, keywords can make a difference if you pay attention to them. Can you really write headlines without keywords? Should the content title literally be: How to (fill in the blank) to build your business? If you can’t work a phrase in your headline, at least pepper it with single keywords. I’ve deliberately added words like “checklist,” “template,” “B2B,” “brands,” “employees,” and “study” to help secure more long-tail keyword phrase rankings. Just like the headline, your page or post has words. How often would you write about something without any thought about whether your content might be found on a search engine? Sure, Google can quickly size up the context of a page and may not care about one keyword phrase. However, you likely will get credit for similar words or synonyms that aren’t even in the content. I’m not advocating a keyword repetition formula because there aren’t any rules along those lines. It helps to have a keyword in the navigation, SEO page title, headline, content, image name, etc. Of course that sounds ridiculous and unnatural. 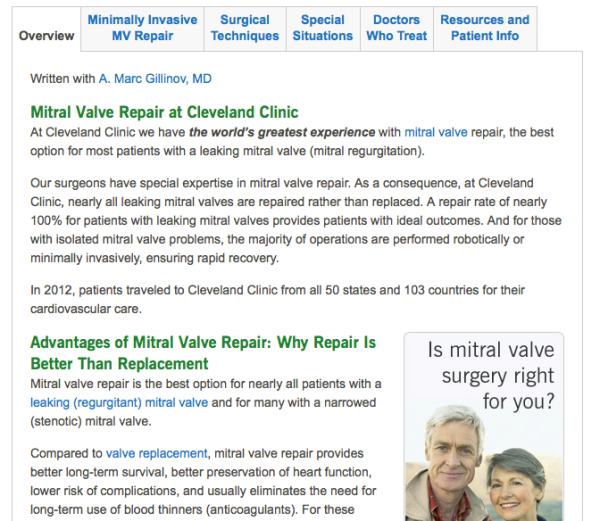 On this Cleveland Clinic page, I see “mitral valve” a million times — and the references are natural. I bet the use of “mitral valve” helps with SEO. Maybe I’m way off the mark here, but I’m guessing that Google and other platforms like SEMrush and BrightEdge make money because of keywords. They’re all about choosing the right keywords. Sure, you might have some trouble knowing how a keyword phrase converts if Google hides it in “Not Provided.” But you can still define a keyword focus for your critical organic landing pages. Use your website analytics, marketing automation, and other software to track how well those landing pages lead to conversion forms and e-commerce sales. Here’s the deal: Every website has a different capacity to rank for relevant keyword phrases. Your website age, domain name, number of pages, content, internal links, inbound links, design, programming, and more will determine how well you’ll succeed. Don’t overlook keywords outright or insist on a short list of five. Whether it’s a set of 25, 250, or 500, target the right content or build some new pages. Your strategy will have some unexpected rewards. 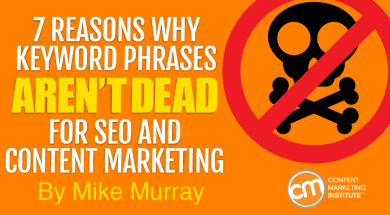 When you use each keyword phrase, it will resonate with all of the other words on the page. You’ll rank for any number of permutations. It’s always been that way with the internet. Increasingly, you’ll just have more opportunities to perform well for keyword variations and even words you never thought to include in your content. You have algorithm changes to thank. Effective use of keywords involves planning and analysis. How are you managing your efforts? Want to stay updated on the latest ways to use keywords and to create high-quality content to improve your search rankings? Sign up for the daily or weekly CMI newsletter.